Having each child realize that they "have the power" to be kind? --priceless!!! You "have the power!" Thanks for energizing my students and me. It was truly priceless. #4. I heard rave reviews from the staff about your “Kindness is Cool” Show you did. My own daughter was so mad.....she was home sick that day. Principal Sue Z.- Rochester Elem. #5. As a parent, just wanted to let you know that both of my boys came home “rapping” about Kindness yesterday after the assembly they had! They both had so many good things to say about the presenter, Rachael Kroog and her positive messages of kindness. Just wanted to pass this along. #6. I had to send this email to you from yesterday! CUTE! The kids were all a buzz today about “Kindness” (whispered with their fingers fluttering) ALL day!!! Your program has had a positive impact on the kids in my building in just one day. You provided very age appropriate ways to help them truly understand kindness and how they want their school atmosphere to be in Rockford! They had a lot to say about your program today and “That’s Not Okay” and the fluttering kindness fingers could be seen all over our building today. The staff has made a commitment to keep the kindness flowing in our building. Thanks for all you did for our school yesterday! Your work is so important in our kindness project this year. It was a perfect day with you!! Let’s keep in touch! #7. “I can’t tell you how terrific the response was to your “Kindness is Cool” show! Everyone loved it and we got feedback that it was the best program we’ve ever had. The children absolutely LOVED it! Thank you for a dynamite, very fun and a thoroughly professional act! #10. A very special thank you for coming to our school and doing such a great job teaching our students about kindness! You had their undivided attention and that just means one thing, YOU ARE AWESOME! I love to hear the things that you taught them used in our first grade classroom! Thanks for our time, talent and energy! ballad “Blue Bayou.” Frederick stayed by her side, of course, to add his own made up verses about losing his toupee back on Blue Bayou. Only Kroog could pull off such a feat keeping the routine fresh, fun and fearless. Savage offered some great steel guitar, too." "Every year, the question is asked: what will Rachael Kroog do? 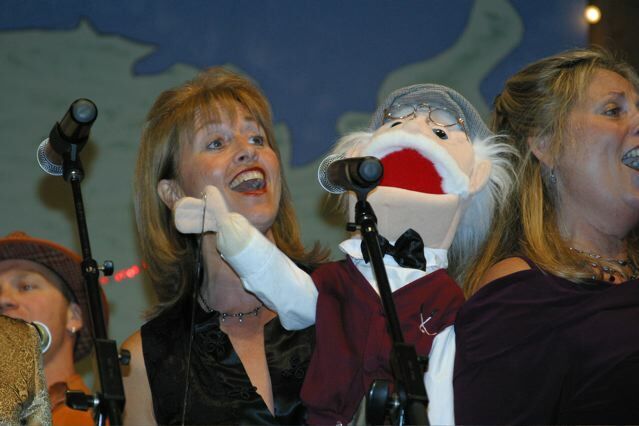 This year, the "character" wasn't so much Rachael herself, but her little old puppet friend Frederick. Rachael chose to take us down "Blue Bayou", but Frederick had other ideas…a lament about tracking down his toupee which, ahem, blew by you….have you seen it?" "Wow, is the first word that comes to mind my mind when I think of Rachael Kroog. She was a fabulous presenter for our Kindness Assembly. You know it is a successful program when students are singing the songs and talking about kindness days after the performance." "As a teacher, I appreciate funny and energetic presentations as much as my students do. Getting the kids involved in the show is a great way to help them have fun and to give your message more meaning. I appreciate the time you took to answer their questions and the encouragement you gave them." "Rachael Kroog, entertainer extraordinaire, was able to move our diverse group of students on a roller coaster of emotion and understanding. Rachael was able to give our students hope and guidance during her performance because she found a way to connect with the audience. She was delightful to work with and was so flexible in listening to our needs and turning it into action." "Rachael Kroog and her band were a true highlight of the 2004 Saint Paul Winter Carnival Ice Palace. Their customized show got the audience clapping, waving, jumping and singing. Despite the cold temperatures, she captivated the crowd with her unique brand of humor and charm, and left them wanting more. " "We really enjoyed your show about kindness! We learned that we can be kind in many ways. We can show kindness by including people, hugging people, helping people, and being friends with people. Thank you for coming to our school. We hope that we can see you again!"